Players running around an empty field in spandex is an imperfect evaluation. But I don’t trust my eyes and quite frankly, I don’t trust the eyes of NFL scouts. “Pick the right players” is not a real draft strategy because prospect evaluation in a large sample has repeatedly been proven impossible. A real draft strategy is to accumulate as many assets as possible to give you a chance to hit home runs. Naysayers will point to players who have finished in the top-10 of fantasy scoring despite falling below thresholds. Devonta Freeman is only 5-foot-8. Kareem Hunt ran a 4.62. Leonard Fournette’s vertical was a pathetic 28.5 inches. Of course there will be outliers, and a huge part of running back success is scheme plus offensive line play, but the point remains that failing to meet the above thresholds is going against the probability of success. With that in mind, here is a look at eight of the projected top running backs in this year’s class. Athletic freaks continue to flow out of Happy Valley. Perhaps overshadowed by Saquon Barkley, Sanders quietly stepped right into the feature role last season and went off for 1,274 rushing yards, 24 catches plus nine touchdowns. He backed that up with arguably the best Combine performance in this weak running back class. The 5’11/211 Sanders banged out 20 bench press reps, ran a 4.49 and was among the leaders in vertical as well as broad jump. Dumping the expectation of being the next Saquon is not fair to Sanders, but he has the athletic profile of a fantasy star. I’ll be watching Sanders’ landing spot closely. Harris was the 1A to Josh Jacobs 1B at Alabama last year. Harris quietly averaged more yards per carry (5.8 vs. 5.3) earned more carries (150 vs. 120). Harris also crushed Jacobs in athletic testing, meeting all the minimum thresholds. They both project as solid contributors in the passing game with upside in that role. However, Jacobs is the consensus top running back in the class among tape evaluators and Harris is a mere afterthought. He’s not a name to take lightly just because he doesn’t have quite the same burst that Jacobs has. Henderson checked in at just 5-foot-8, but easily met all the other thresholds. His college rushing stats are otherworldly (3,063 yards, 8.9 YPC, 31 TDs) as he destroyed overwhelmed opponents in the AAC with a powerful offensive line. But what he’ll have to show at the NFL level is an ability to play a big role in the pass game as well as contribute between the tackles. As noted by Rotoworld, tape guru Greg Cosell compared Henderson to James White – who was fantasy’s No. 10 RB last season in PPR points per game. Other undersized backs to crack the top-10 over the last four years include Chris Thompson, Devonta Freeman and Danny Woodhead. Hill came in at just 198 pounds, missing the weight threshold. 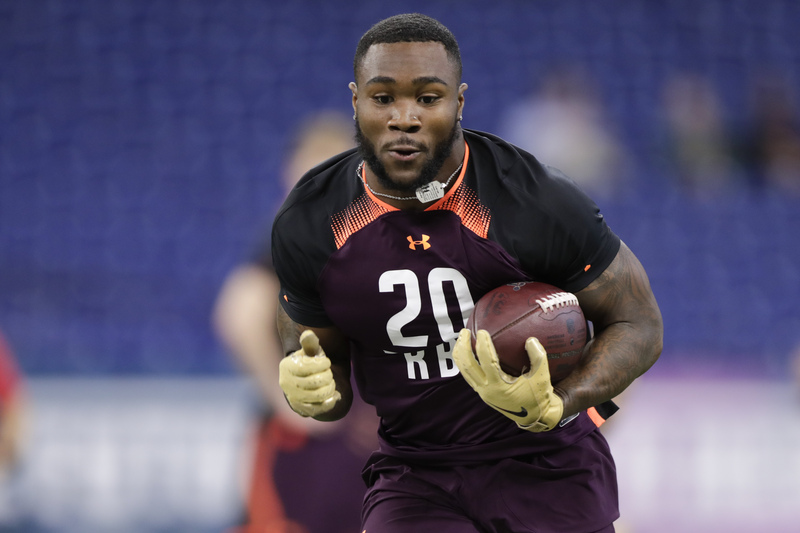 But he did blow the doors off the Combine with 21 bench reps (among the RB class leaders), a 4.40 forty, a class-high 40-inch vertical leap and an elite 130-inch broad. Among running backs likely to go in the first four rounds of the draft, Hill’s 88.5th percentile SPARQ score was the best. There’s a nice floor here as Hill has the mold to grow into a strong space player. It’s also encouraging he was extremely productive at a young age, going 206-1142-6 rushing as a true freshman in 2016. Jacobs’ measurements come with a significant asterisk as they were unofficially recorded at Alabama’s Pro Day. He did not participate in the NFL Combine due to a groin injury. We know that Pro Day results are almost always notably better than a player’s Combine results. With that in mind, Jacobs’ athletic profile is concerning. The 4.60 forty he ran likely would have been in the mid-4.6s at the Combine, placing him outside the minimum threshold. Jacobs’ 112-inch broad jump is easily the worst among any of the 26 “elites” who have been fantasy top-10s over the last four years. Jacobs also didn’t crush the bench, only posting 18 reps – three over the minimum threshold. I suspect if this was a stronger running back class, Jacobs would be nowhere near the first-round. But in this class, his stock is getting propped up. Montgomery was supposed to be an athletic freak, which made his Combine performance startlingly poor. He ran a slow 4.63 forty and posted a pathetic 28.5-inch vertical, both below the minimum threshold. He also barely got there in the bench with 15 reps. Montgomery does fit the current NFL RB mold as a solid pass-catcher, recording 58 receptions in his last 25 college games. However, his athletic skill set makes it unlikely he’ll be able to win a true feature back role and get into the top-10 of fantasy running backs. Armstead’s powerful 5’11/220 frame was on display at the Combine when he ran an impressive 4.45 and got 22 bench press reps up. But his inability to contribute in space or in the passing game showed up as he failed to meet the minimum thresholds in both the vertical and broad jumps. There’s not a lot of room for two-down pounders in today’s NFL and there’s even less room for them in the top tier of full-PPR fantasy systems. Armstead will likely need a LeGarrette Blount Patriots era kind of workload to sniff the elite range. It’s really tough to be a top-10 fantasy back at Singletary’s height of 5-foot-7 and speed of 4.66. The small-school product also fell short of minimum threshold in the broad jump by leaping a mere 117 inches and inched over the line in the bench with 15 reps. Danny Woodhead checked in at 5-foot-7, but had 4.38 speed and ripped off 20 bench press reps. Chris Thompson was just 5’7’192 but had 4.42 speed and 21 bench reps. I didn’t have enough data to create a minimum threshold for the 3-cone drill, but it’s worth noting that Singletary really struggled there at 7.32 seconds. Overall, Singletary’s 7.8th percentile SPARQ score speaks volumes.